Happy almost Valentine's Day! I'm declaring February "the month of love" on the blog. And by that I mean I'll wrap up any lingering wedding posts. If it doesn't get posted this month then it's not going to make it on the blog. But I promise to work really hard to draft these wedding-related posts and get them posted. I thought it would be fun to detail our wedding attire and where some of our inspiration came from. In the meantime, we'll kick off "the month of love" with our meal from last Valentine's Day. The post got delayed because of wedding planning but also because Patrick and I have a tradition of having manicotti as our Valentine's meal: see 2010 reference, 2011, 2012, and more details on 2012. I didn't want to bore you with more manicotti but I thought it was still appropriate to share because, even though the entree is the same, I made us a personal cake for dessert! Made it in a tin can! It was so cute! Personal Red Velvet Cake. Perfect for your Valentine! Valentine's Day is in just under two weeks too. If you need a dessert idea I highly recommend this! Here are a few snapshots from Valentine's 2013. I'm not really sure what inspiration I had for the personal cake. 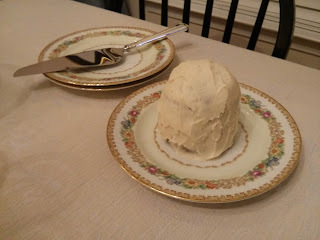 I somehow managed to find the two blog posts that I used for this dessert last February. The original mini vanilla cake recipe is from The Baker Chick blog and I made this adapted mini red velvet cake from Ashleigh Homemaker blog. Preheat the oven to 350. 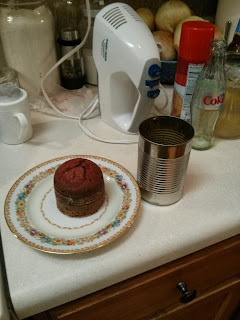 Make sure your tin can is completely clean and dry and use an organic brand if possible. Coat it with either butter or cooking spray and flour. Cut a small round of parchment paper and place it in the bottom of the can. In a small bowl whisk together egg white and sugar well. Add the butter and vanilla and mix again. Add the dry ingredients, whisking softly to combine. Fold in the buttermilk, vinegar and food coloring. Pour the batter into the can and bake for 25-30 minutes or until a toothpick comes out clean. Let cool completely, then turn the little cake out onto a plate. Slice off the rounded top of the cake and eat it and then slice the rest into 3 pieces, the lines created by the can will help to make them straight. Frost with your favorite frosting. I like cream cheese frosting, which you can easily make a small amount of. Just combine about 2 T unsalted, softened butter, 2 oz softened cream cheese, 1/8 C powdered sugar and a dash of vanilla. Or use store bought if that's what you have on hand. Enjoy! Chilling in the fridge until ready to be served. I think Patrick was impressed! 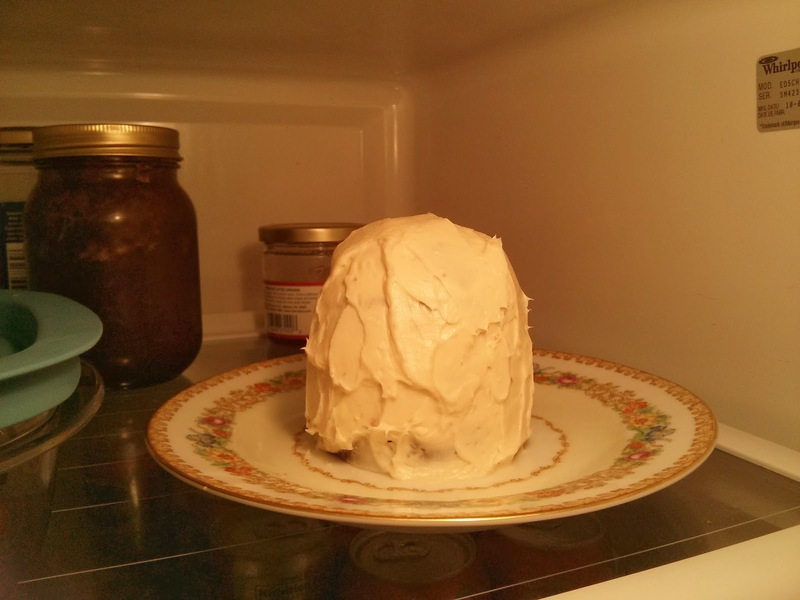 I tried to keep dessert a surprise but I think he opened the fridge when he came off after work and saw it chilling on the top shelf. Patrick and I are deviating a bit from the manicotti this year; will keep you updated on our plans after they unfold! No worries; there is still manicotti in our future. The cakes are so original. I love the pics. The cakes look so pretty on the china. I will make sure Granny sees this. Happy Almost Valentine's Day to both of you! I love the petite little mini-cake idea!